Simple king suite crafted from solid pine includes a 2-drawer platform storage bed, a 6-drawer dresser and matching mirror in simple brown finish. With its simple silhouettes crafted from solid pine, the Beckham bedroom strikes the perfect balance between contemporary and rustic styling. The king platform bed showcases a paneled headboard and a footboard with two storage drawers on smooth ball bearing glides. The dresser boasts six additional dovetail drawers with the same horizontal metal handles, offering a subtle but pleasing textural and tonal contrast to the versatile brown finish on each piece. A square beveled mirror completes this king suite. 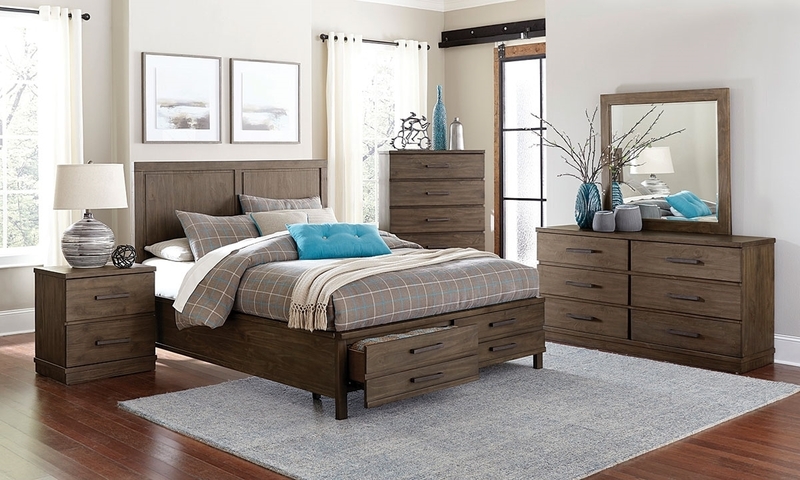 Simple queen suite crafted from solid pine includes a 2-drawer platform storage bed, a 6-drawer dresser and matching mirror.